A central irony behind Trump's rumored "threat" that he could withdraw or at least greatly reduce American troops stationed in Germany, who last month wrote to Angela Merkel of “growing frustration in the United States that some allies have not stepped up as promised” on defense spending, is that Germans don't actually want US troops on their soil to begin with, according to a new poll. On Wednesday Trump slammed Germany from the moment he touched down in Brussels for expecting the US to foot the bill for Europe's security in the face of Russian aggression while Germany and others cut massive energy deals with Russian energy companies. In an exchange the president promptly posted on Twitter, he said Germany is "totally controlled by Russia" in reference to the planned Nord Stream 2 pipeline, which is to supply the country with Russian natural gas. "Germany is a rich country,"Trump said, implying it should increase spending on its own defense. It appears the German public agrees with Trump on this point as a YouGov poll — the results of which were first published for the dpa news agency on the first day of the NATO summit — finds that Germans would actually welcome American troop withdrawal from their soil (though a policy of outright US withdrawal is not on the table this week, nor is expected to be broached... but with Trump, who knows?). The poll found that "42 percent said they supported American withdrawal while just 37 percent wanted the soldiers to stay, with 21 per cent undecided." 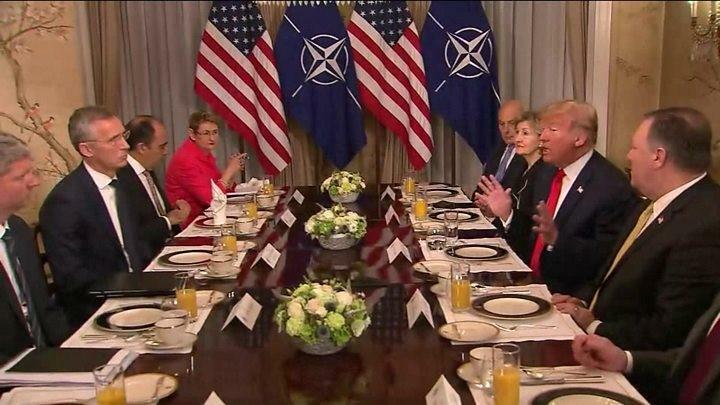 Trump has lately berated other NATO member states for not living up to a 2014 pledge to reach two percent of GDP on defense by 2024, as only three European countries have reached the mark. Germany, which has had tense ties with the US in recent months, has already indicated it will be unable to meet that goal; Poland, however, has met the target. A continued theme the president is expected to emphasize this week in Brussels is to urge other governments of the alliance to dramatically increase military spending and lower import tariffs. The same poll also found significant opposition to militarism in general in the country. Just 15 per cent of all Germans agree with Angela Merkel that the country should increase its military spending to 2 per cent of GDP by 2024, with 36 percent saying the country's already spends too much on its military. So interestingly, those surveyed tend to favor American security draw down in the heart of Europe along with a humble German foreign policy. It could be that like many in the US, Germans are increasingly aware that such entangling (and some might say outdated) alliances as NATO only creates more unnecessary tensions and trouble in a world increasingly nervous over Western expansion and hegemony (a Cold War era "north Atlantic" alliance used for regime change in north Africa being a prime example). Should this come as any surprise? Similar polls over the past decade have shown the German public to be simultaneously desirous of close ties with the United States yet consistently opposed to Washington dragging Europe into military campaigns abroad. Surveys have consistently shown that Germans are far less supportive than Americans regarding the use of military force to maintain order in the world: in 2011 75 percent of Americans voiced the view that force is sometimes necessary compared with only 50 percent of Germans. More than 80 percent of Germans supported Berlin’s decision to not use military force in Iraq, according to Pew Research surveys at the time. In Afghanistan, where Germany had troops, by 2010 and 2011, majorities of Germans wanted NATO and U.S. troops withdrawn. And Germany abstained in the United Nations vote on intervention in Libya. Indeed, the latest Pew Research survey finds a distinct German reticence about taking on more of the global security burden. Asked if Berlin should play a more active military role in helping to maintain peace and stability in the world, only 25 percent of Germans agree. Last month, a report suggested the Pentagon is already in the process of tallying the cost of keeping troops and its vast military bases (the US has over 20 - and many other joint command locations - with Ramstein Air Base being the largest; and at the height of the Cold War there were over 200) in Germany ahead of possible withdrawal. However, early this month Pentagon officials denied such an audit is taking place. It will be interesting to see if Trump, in his notorious off-the-cuff and unpredictable manner of speaking, actually pulls this out as a negotiating card either publicly or in private exchanges in Brussels this week. Each year, Germany contributes nearly $1 billion to the upkeep of U.S. bases in Germany. Ramstein Air Base, the biggest U.S. base in Germany, costs about $1 billion annually - an amount equal to Germany's yearly contribution toward the upkeep of U.S. bases. On average, the other 43 bases cost about $240 million each — about the same as a single F/A-22 fighter jet. With 34,000 American residents, Kaiserslautern is the largest American community outside of the United States. Since 1945, some 17 million Americans have served tours of duty in Germany. Many return time and again as tourists.